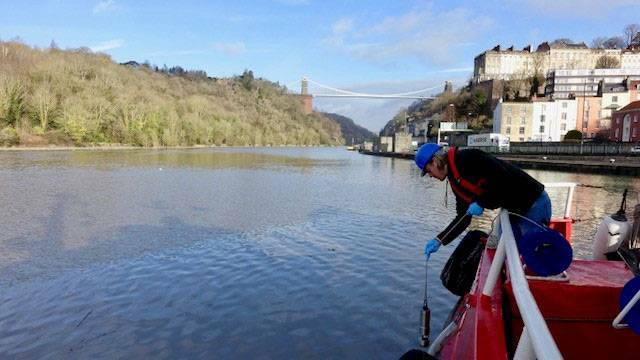 In early march 2018, an opportunity arose to join the Bristol Port survey team on a survey of the entrance to the city docks. Surveyed twice a year to monitor dredging requirements it gave Valeport the chance to collect sound velocity and turbidity profiles in the lower reaches of the Avon river as it joins the Bristol Channel and further up river where there is a much stronger fresh water influence. The SWiFTplus takes the proven platform of the Valeport SWiFT SVP and adds a state of the art turbidity sensor designed and manufactured by Valeport. The new sensor incorporates a Nephelometer(NPH) and an Optical Backscatter Sensor (OBS) in a compact and robust package that is seamlessly integrated into the main body of the SWiFT housing. The turbidity sensor is also available as a standalone unit for use with 3 party systems. Optical Backscatter vs Nephelometry — which is best? Nephelometry (NPH) is the technology of choice for low concentration suspended sediment measurement. Up to ~1,000 normalised turbidity units (NTU) the SWiFT’s turbidity sensor’s response is linear in nature and a robust calibration procedure to traceable standards can be carried out. At higher concentrations the sensor becomes increasingly non-linear with the effect at high concentrations (>2,000 NTU) of suspended particulate matter (SPM) the observed turbidity values start to roll over and decrease despite the increasing sediment concentration. Optical backscatter measurement (OBS) is less reliable in low concentration of SPM but remains linear up to ~10,000 NTU and reliable at concentrations up to 20,000 NTU. Combining the two types of optical turbidity sensor into a single sensor provides a truly versatile instrument that can provide a unique insight into the optical properties of the water column and its relationship with suspended sediment. For both parameters, a local site calibration is essential if quantification of the sediment load is required. Particle albedo and grain size distribution of the local sediment can affect the intensity of optical returns, combining the two measurements into a single sensor with the same water volume being simultaneously sampled opens up a number of possibilities for data processing and sample characterisation. To coincide with the launch of the SWiFTplus, Valeport has released a new software package. 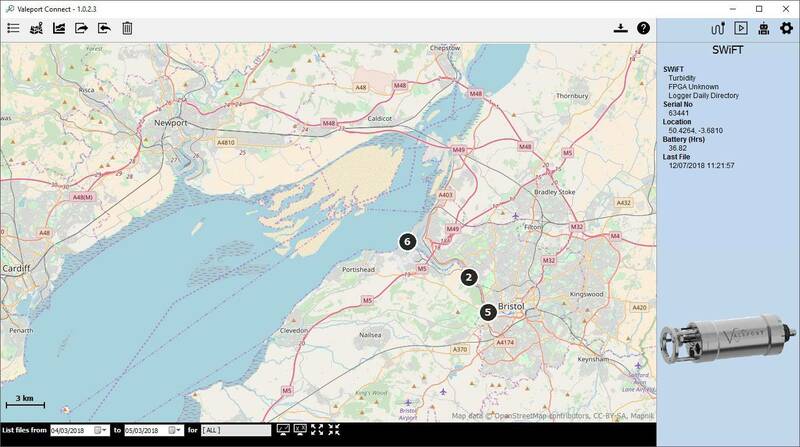 Connect has been designed and developed with the requirement of the online surveyor in mind. 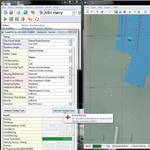 Available on Windows PC and iOS portable devices, Connect streamlines the acquisition, download, assessment and conversion of sound speed profile data files for onward use in all major hydrographic processing packages. Using the coordinates and UTC time stamp from the integral GPS receiver, profiles can be filtered and selected by position or date and time as well as the instrument used to record the data. 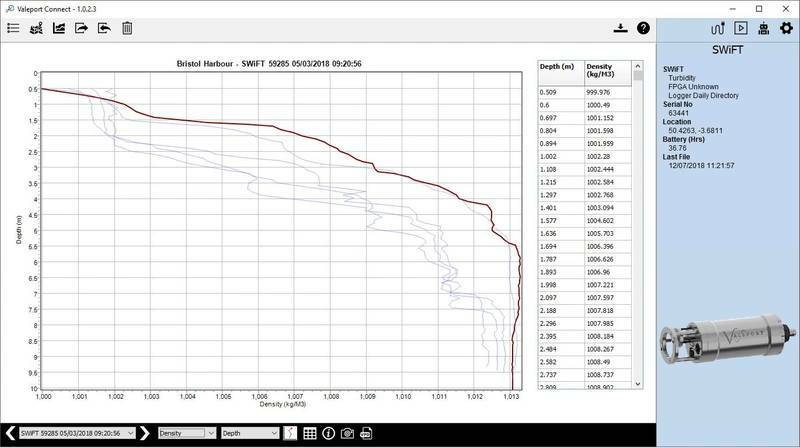 Selected profiles can be viewed individually or as a group, as shown in Figure 6, for quality assessment before being exported in industry standard data file formats. A major feature of Connect software is a fully automated download function. Recognising industry feedback about the repetitive nature of acquiring sound velocity profiles as part of survey operations, when operating in a ‘Smart Profiling’ mode, it is possible to deploy the SWiFTplus, record profiling data and on recovery to the surface, Connect will automatically establish a Bluetooth connection to the SWiFTplus, download the profile data, and convert the file into a user selectable file format ready for immediate use. In most cases, the profile will be downloaded and converted within 60 seconds of recovering the SWiFTplus to the surface. While initially developed to reduce the load on the online surveyor, automating this process has opened up possibilities for machine-to-machine communication and control with automated vehicles and deployment systems. 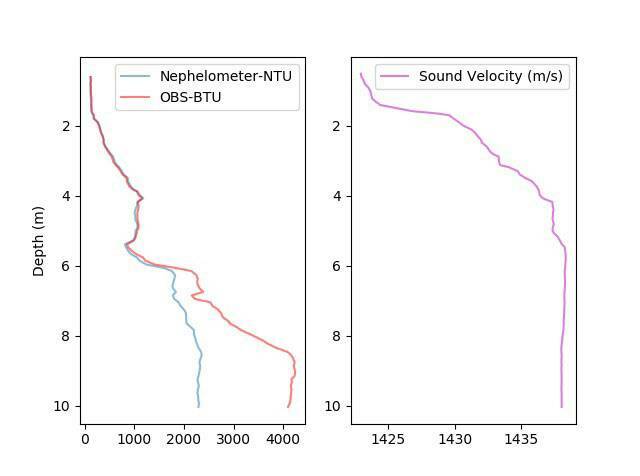 Water column profiles of sound velocity, temperature, pressure, NPH &OBS were taken in a number of locations in the estuary, see Figure 4. At the survey area, near the inner harbour entrance a number profiles were collected in the 30 minutes before slack water. In the absence of a site calibration from filtered sediment samples, the OBS data has been corrected to the NPH data with a linear fit below 1000 NTU. A laboratory calibration of the NPH and OBS sensor in AMCO Clear, sets the relationship to 1:1 below 1000 NTU. Field observations in the rivers Avon & Severn showed this relationship to be closer to 1:0.7, this is most likely due to the lower albedo (reflectivity) of the sediment type compared to AMCO Clear and highlights the importance of site calibrations. At the entrance to the city docks, significant stratification was apparent with a ~15 m/s difference in sound velocity between the surface and seabed. This is caused by the fresher river water overlying the more saline waters from the estuary. The fresher surface layer shows much lower concentrations of SPM. In the lower half the water column the turbidity increases significantly in the more saline water travelling upstream from lower in the estuary. Below 6m the NPH and OBS sensor start to diverge, this is due to the non-linear behaviour of the NPH sensor, with the OBS sensor showing the true profile in high concentrations of SPM. Using only a NPH sensor, it would be easy to underestimate the sediment load present within the water column, especially at higher concentration in the deeper estuarine water. 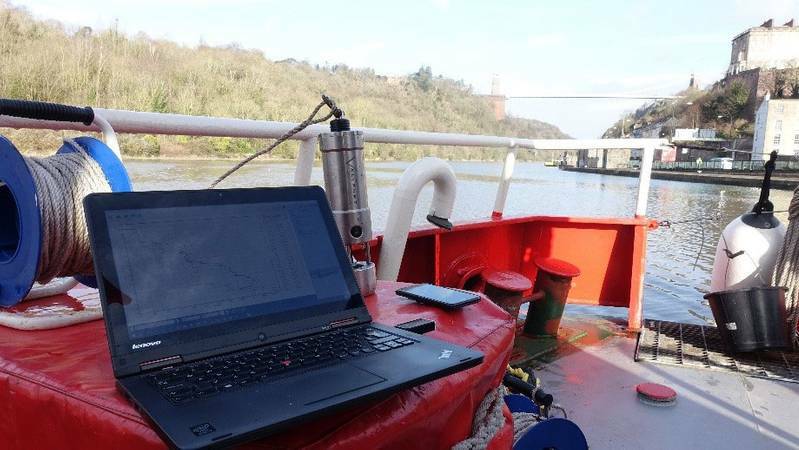 The OBS sensor provides invaluable information at higher levels of SPM to understand the sediment dynamics within the Avon estuary. In Figure 6, a Density profile is plotted. Density can be seen to steadily increase with depth in the warmer freshwater and then at a maximum and consistently through the estuarine water below. Density, in this case, has been calculated using Valeport’s DASH formula where Sound Velocity, Temperature and Pressure are used in the calculation. The SWiFTplus with integrated turbidity sensor, combined with the Connect software package offers the Surveyor and Hydrologist alike further opportunities to better understand the water column by monitoring additional factors, synchronously giving a true snapshot of the water column. In operations where turbidity is a contractual parameter to be monitored this can be achieved as part of a standard profiling activity for Sound Velocity, for example, Density is calculated from observed data with no additional overhead. Connect has streamlined the data collection process allowing more data to be collected more efficiently and made available more quickly. Valeport has led the way in sound velocity technology for more than a decade and our latest addition to the portfolio, the SWiFTplus, was designed from the outset with customer feedback front of mind and a practical understanding of what customers actually want from an instrument. 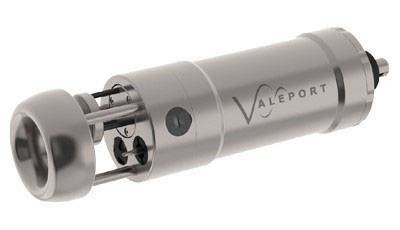 Valeport is a leading British manufacturer of oceanographic, hydrographic and hydrometric instrumentation. Valeport designs and manufactures instrumentation for a worldwide customer base that includes: defence, environmental, oil and gas, renewable energy, construction, dredging and civil engineering sectors. Valeport has supplied the subsea sector since it was established in 1969, now an independent, family owned business, Valeport designs and manufacturers instruments from their base in Devon, in the south west of the UK and works with a global network of agents to ensure a responsive and efficient worldwide service.